Weave your way along ancient trade routes and experience the melding of cultures on the Silk Road, from China to Europe, that created great civilizations and unique monuments. Explore Turkmenistan, Uzbekistan and Kazkhstan, accompanied by the rhythm of the railroad on your own private train. You land where mountains meet the desert, in Ashgabat, Turkmenistan’s extraordinary capital city. Soon you’re traveling along newly-built boulevards, past golden domes and marble monoliths to your hotel. Rest and take your bearings. Tomorrow you will explore Kazakhstan’s vibrant young capital. Amid the early morning bustle, you dive into the vast, dizzying delights of a typical Central Asian market. Scents mingle: rugs, piled spices, sheepskin, sizzling street food. Soon you leave the day’s deals behind and head to the ruins of ancient Nisa and its relics in the National Museum. After lunch, you tour Ashgabat, its new marble buildings a gleaming display of the city’s oil wealth. At daybreak, your private train draws into the ancient oasis of Merv. In the twelfth-century, this was one of the largest cities in the world. Nourished by the Silk Road, its fame crossed continents. Now you stand surrounded by imposing ruins that rise up from the desert sand, and crumbling arches framing a bright blue sky. You walk among the relics of this UNESCO World Heritage site, including the gigantic Tomb of Ahmed Sanjar, the Virgin Fortress and the cold room, and are invited to lunch in the courtyard of a family home. Next stop: Bukhara. Beneath the imposing yellow brickwork of the Kaljan minaret, you gaze at the magnificent gateways on either side of the courtyard, each a heady cocktail of intricate tilework and grand design. This is only a first glimpse of old Bukhara, a site of UNESCO World Heritage holding a miraculous city-museum of a thousand monuments, each a testimony to the glory days of caravan trade. At the Lyab-i Hauz ensemble, you witness the 500-year-old architectural ingenuity that keeps a pool full in the baking Kysylkum desert. You learn about the satirical Sufi Nasreddin Hodja, watch local dances, listen to exotic Uzbek tunes and have dazzling national costumes paraded in the courtyard of a madrasah. Another long, glorious, desert day devoted to the infinitely rich Bukhara. 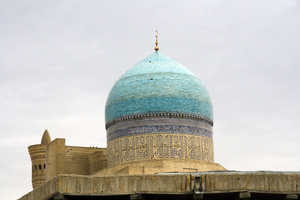 From the sumptuous stylings of the Mire-e-Arab Madrasah, you move to the textured geometry of the Samanid Mausoleum regarded by many as the most beautiful and precious building in Central Asia. Then onto the gargantuan, 1,500-year-old Ark fortress, the only women’s mosque in the country. Standing on its vast rampart, you take a last view out over Bukhara, glistening turquoise and yellow in the bright afternoon light. A diamond in the dust. A last morning exploring the streets of Bukhara before you board the train and depart for Khiva. Spectacular landscapes of steppe, sky, rock and distant mountains scroll by the window. This is Khiva, an ancient city fortress. Beneath the vivid blue glazed bands of the Kalta Minor Minaret, you set out through the sun and shadow of winding streets on a dreamlike tour of the town’s palaces, mosques, mausoleums and madrasah. All inhabited, thriving – a living museum. You lunch in the old Summer Palace of the Emir. Another day to soak up the UNESCO World Heritage site of Samarqand on this train journey. Delve into its Islamic past and sift through its riches. You see Uzbek craftsmen skillfully weave silk into carpets and press paper from mulberry bark, before casting your eyes to the magnificent past at the Ulugh Beg Observatory, the ruins of Bibi Khanum Mosque and the impressive Gur Emir Mausoleum. 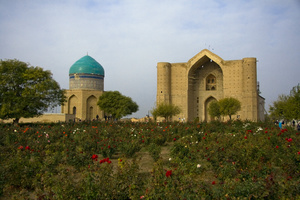 Under wide blue skies, you explore Shahrisabz, a UNESCO World Heritage site. Timur, the fourteenth-century Mongol conqueror, filled this once-mighty city with grandiose testaments to his earthly power. Now his palaces stand in ruins around you in the bustling market town: crumbling reminders of a lost empire. You experience a folklore performance, and meet some of the locals in a small village. Before night closes in, the train departs, and you join fellow travelers for an Uzbek wine tasting in the dining car. As you eat breakfast, the glorious steppe unfolds outside the window to the steady beat of the railroad moving along the tracks. Soon you arrive in Turkestan, and stand before the magnificent Mausoleum of Khawaja Ahmed Yasawi, the vast, brightly tiled testament to power and beauty that UNESCO have made a World Heritage site and the Kazakhs revere as their national icon. Seven nights on an exclusively chartered train. Six nights in mid to high-end hotels. Excellent service, whether from your tour director, group guide or local guide, each with excellent command of English. All excursions and sightseeing as per itinerary, including entry fees. Transfers and bus tours as per itinerary. Hugely popular catering, with local specialties prepared on board and served as per itinerary. Attentive porters at all railroad stations. Entertaining and enlightening lectures on local lands, people and cultures. A booklet on the region and the train itself for each reserved compartment. 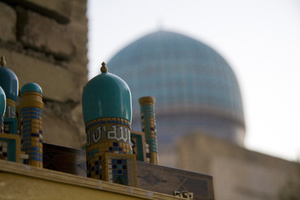 Traditional welcome ceremonies in Bukhara and Samarqand. Insights into everyday life, witnessing crafts and traditions such as silk carpet weaving. The fascinating excavations at ancient Afrosiyab. The 600-year-old Ulugh Beg observatory. The spectacular nature of the Karakum and Kyzylkum deserts and the Tian Shan mountains.